1) You are using the wrong products. The United States skin care market is supposed to reach $11 billion by the year 2018. That means there are a lot of products out there that can break you out. With so many options on the shelves and online, it is important to understand which products are skin type appropriate for YOU. Unsure what your skin type is? That is a good reason to visit a dermatologist and find out. In general, people who are prone to acne should use only “non-comedogenic” products, meaning products that do not clog pores. This means no waxes, petrolatum, shea butter, or oil of any kind. Generally, it is best to avoid anything in an ointment, serum, or heavy cream base. If you use greasy products in your hair, they will end up on your face and back. Clogged pores lead to pimples, so if you see them, head over to your dermatologist for an extraction procedure to have them removed. In cases of product-induced acne, altering skin care, potentially starting a topical retinoid (vitamin A based medication), and regular extractions by a dermatologist will generally be curative. 2) You are taking medication that causes acne. There is a whole list of medications that have acne as a potential side effect. These include commonly used oral contraceptives and intrauterine devices, as well as anti-seizure medications, steroids, antidepressants, the immunosuppressant cyclosporine, androgens, and even over the counter supplements like DHEA, Vitamin B6, and Vitamin B12. If you are taking a medication that causes acne, there may be alternatives that can be utilized. In cases where there is no feasible alternative, a dermatologist can help devise a plan to counteract the effects. 3) You don’t actually have acne. Several skin conditions present with what looks like pimples, but are not actually “acne.” For example, patients with rosacea can get papules and pustules over a background of redness and broken blood vessels. Perioral dermatitis, a facial rash in the rosacea family, presents with scaly red bumps around the mouth, nose, or eyes. There are also several types of folliculitis (infection of hair follicles), caused by yeast or bacteria, which can be acne like in appearance. Finally, pseudofolliculitis can cause bumps in hair bearing areas after hair removal. In pseudofolliculitis, ingrown hairs cause an inflammatory, pimple like reaction in the absence of a detectable infection. Each of these conditions is treated differently, so it is important to get an accurate diagnosis by a dermatologist before assuming you are dealing with traditional acne. 4) Your acne is hormonally driven. 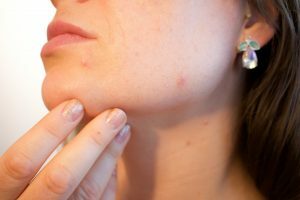 If you are a woman who has recurrent cystic acne on the chest, back, and/ or the “beard area,” meaning the jawline, chin, cheeks, and neck – you may have hormonal acne. Hormonal acne is notorious for being cyclical, with calm periods alternating with multiple cysts appearing at once, usually around menstruation. Traditional acne treatments, like topicals, oral antibiotics, and even isotretinoin, typically do not work as well in hormonal acne, especially in more severe cases. When acne is hormonally driven, the cause may be excess androgens (male hormones) in the body or hypersensitivity to hormone fluctuations. Patients who have excess androgen levels usually have additional symptoms like excess hair growth, hair loss, and/or irregular periods. In these patients, a workup checking hormone levels and an evaluation for polycystic ovarian syndrome may be necessary. The most effective treatments for moderate to severe hormonally driven acne are specific birth controls with favorable estrogen/ progesterone combinations and/ or spironolactone, an anti-androgenic medication, along with proper skin care and a topical regimen. 5) Your acne is a severe subtype. All medical conditions live on a spectrum ranging from mild to moderate to severe. Signs of severe acne include large inflamed cysts, interconnection of cysts, textural scarring, abscess development, large comedones, and recalcitrance to treatment. This type of acne may be associated with boils in the armpits or groin, abscesses on the scalp, and cysts at the base of the spine (pilonidal cyst). For severe acne that is scarring and/or has not responded to traditional treatment, serious consideration should be given to isotretinoin. If you are breaking out 30s, see your dermatologist to ensure you have the correct diagnosis and to get on an appropriate regimen. Early treatment is the best way to prevent scarring.